Among the many lessons the US military learned from the war in Afghanistan (beyond, of course, don't engage in a land war in Afghanistan) is the need for continuous battlefield surveillance. To help do that work, Boeing developed the Phantom Eye UAV, a drone aircraft that can scout a theater of operations for up to four days at a time without blinking. Officially known as the Phantom Eye, this high altitude, long endurance (HALE) UAV developed by Boeing Phantom Works grew out of the contractor's previous success with the Condor UAV which set multiple altitude and endurance records in the late 1980s. The Phantom Eye builds off that success and could soon lead to an unmanned system capable of 24/7 intelligence and surveillance. To stay aloft for that long, the Phantom Eye relies on a mix of hydrogen power and portly aerodynamics. "It isn't built for stealth—it's built for endurance," Chris Haddox from Boeing Phantom Works told BBC News. The plane sports a 150-foot wide wingspan and is powered by a set of 2.3-liter Ford engines that turn the quad-blade propellers. In fact, these are the same engines that power the Ford Fusion diesel. They've simply been modded and retuned to run hydrogen. 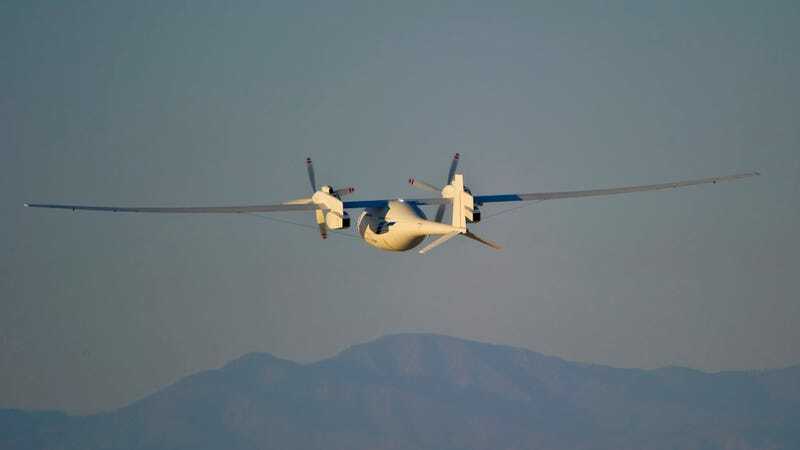 The UAV can carry up to 450 pounds of equipment—in addition to the 1,900 pounds of liquid hydrogen—while cruising at an average speed of 150 knots (170 MPH) and as high as 65,000 feet. To maintain combustion at those heights, the Phantom Eye leverages a multi-turbo system to compress the thin air enough to burn—it also reduces the plane's heat signature, making it harder to track. "Phantom Eye is the first of its kind and could open up a whole new market in collecting data and communications," Darryl Davis, president of Boeing Phantom Works, said today at the unveiling ceremony in St. Louis. "It is a perfect example of turning an idea into a reality. It defines our rapid prototyping efforts and will demonstrate the art-of-the-possible when it comes to persistent intelligence, surveillance and reconnaissance. The capabilities inherent in Phantom Eye's design will offer game-changing opportunities for our military, civil and commercial customers."